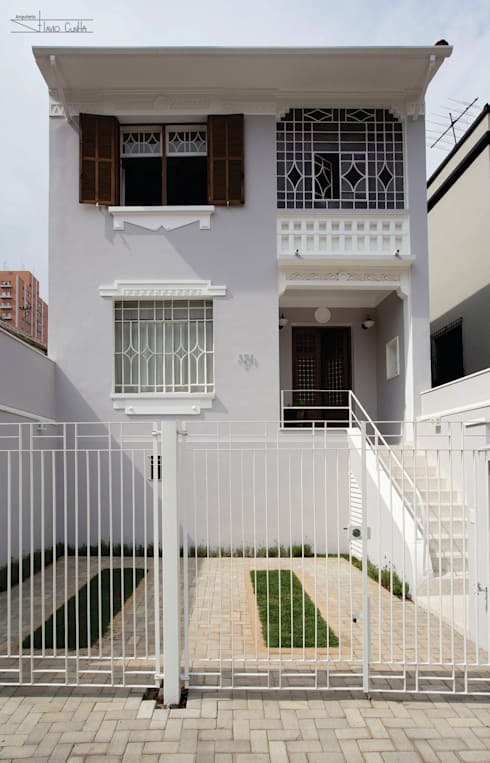 The retrofit consists of reforming or repaginating a space for its better use and at the same time for its preservation. This is the big difference between retrofit and retirement. Reform is not concerned with reusing materials. Whereas, retrofit projects have the objective of modernizing or updating the existing structures by reusing the available resources to the maximum. 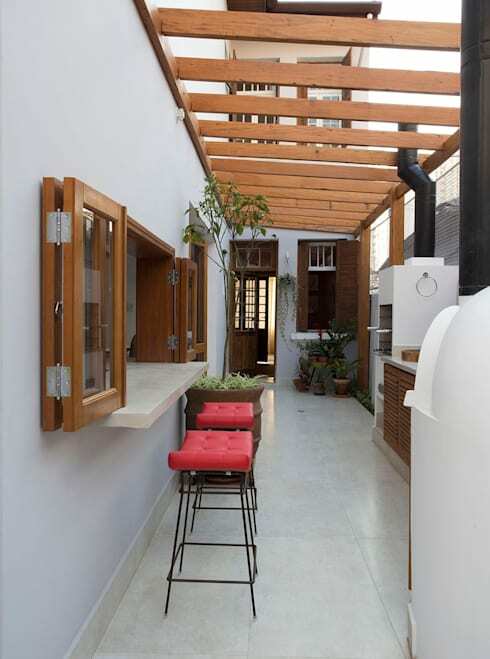 Today, we present a spectacular retrofit project of an old townhouse residence, which is done by the SET Architecture and Constructions Studio. 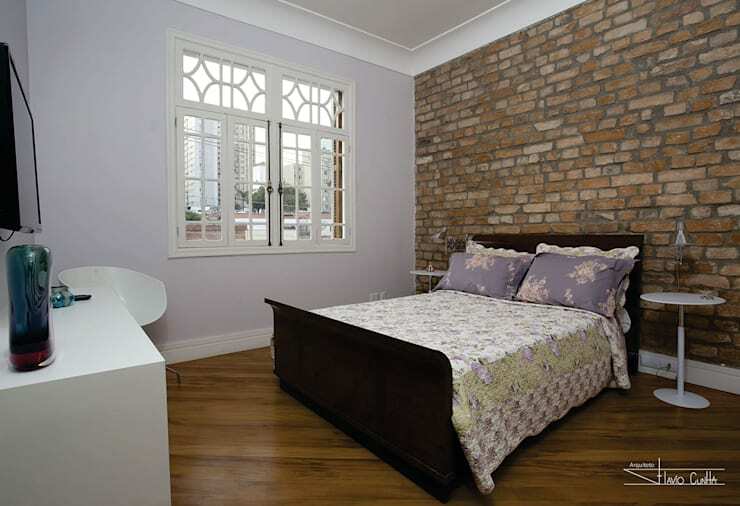 The primary aim of this project is to preserve and enhance the original building. It also focuses on increasing the feeling of comfort and coziness of each room along with adding more practicality. If you are curious to know more about the charms of this fantastic residence, then check out all the details and pictures with this ideabook. 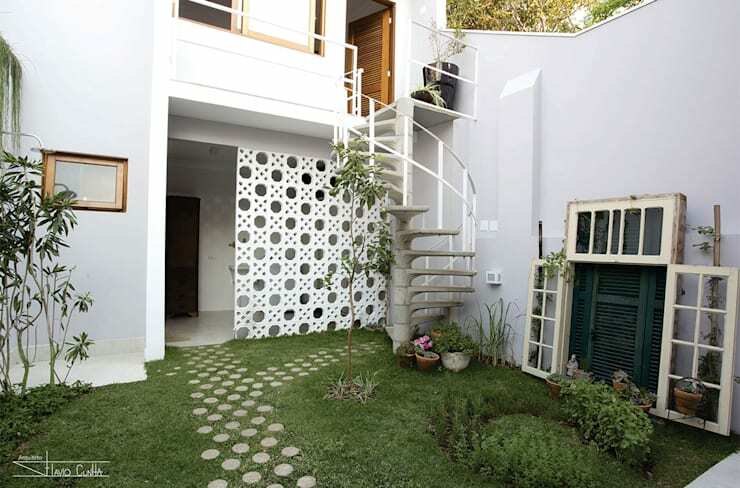 The house has been completely transformed into a modern and charming place. As we can see, the facade of the residence has been restored by giving it a new layer of paint. This new colour even highlighted the friezes and details. But the project prioritized keeping intact the essence of the building. These features include the original metallic grid and coloured stained glass, which highlight the longevity of this building. As we know, the primary focus of the retrofit project was to upgrade the environment by using new colours and materials. Also, by reusing and repaginating all the furniture and accessories. 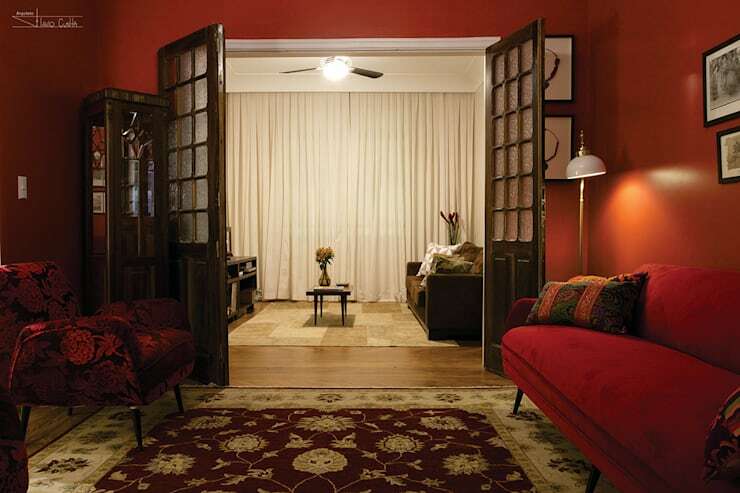 The living room has gained a striking personality with the red colour paint on the walls. The matching retro-style armchairs and floor rug give it an elegant touch. The layout and interior structure of the building did not undergo significant changes. The division of the all the spaces was preserved. The living and TV rooms are divided by a double wooden door, which can be opened completely when the integration of the surroundings is desirable. The TV room provides a more serene atmosphere by highlighting the neutral colour palette of the beige walls and the brown tone furniture. It complements the vintage style wooden furniture perfectly. The restored wooden floor adds warmth, while the curtains, decorative frames, and custom cushions add a personal touch to the ambiance. The staircase is a structuring element. 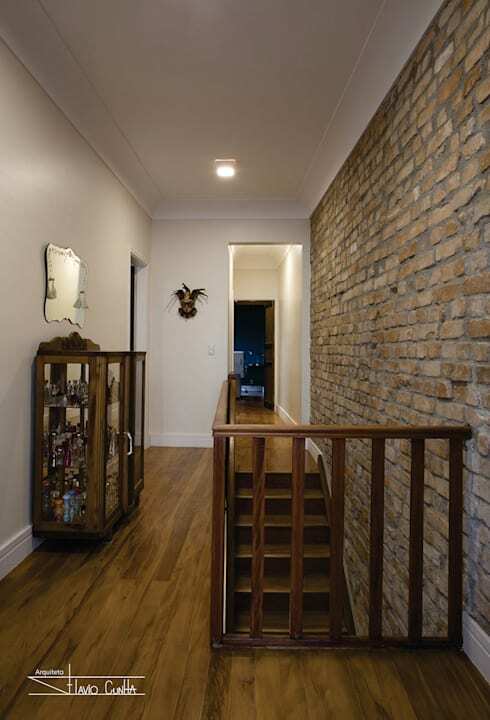 Also, together with the exposed brick wall, it enhances the sense of unity within the room. The wood that lines the floor and the ceramic tiles create a feeling of coziness and give it a rustic touch. 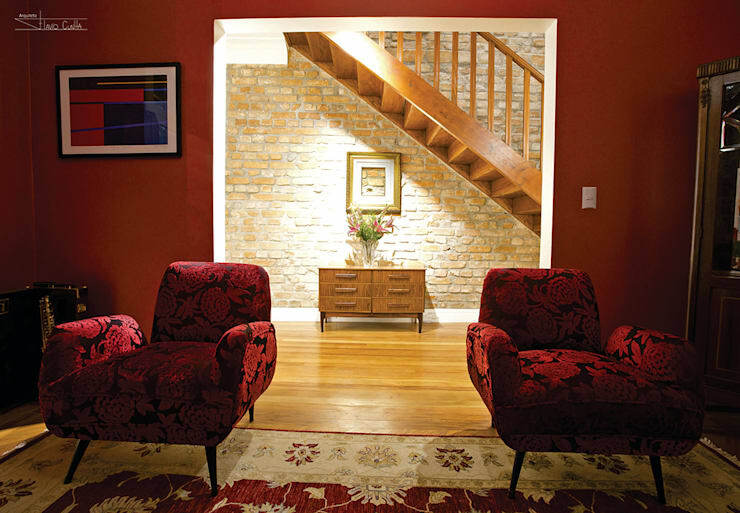 Nothing is cozier than a wooden floor, with diagonally laid boards and brick walls. This is apparently the same design concept chosen for the bedroom. 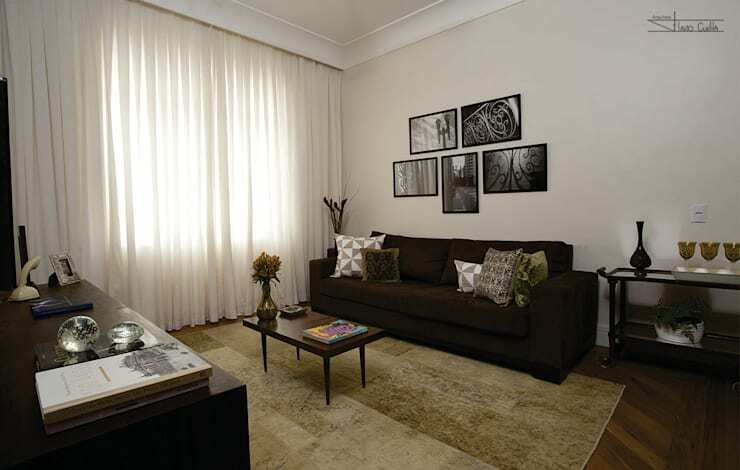 The soft neutral colours enhance the vintage style and add a touch of elegance to the environment. The decoration of the room not only creates a beautiful ambiance but also uses the space well. 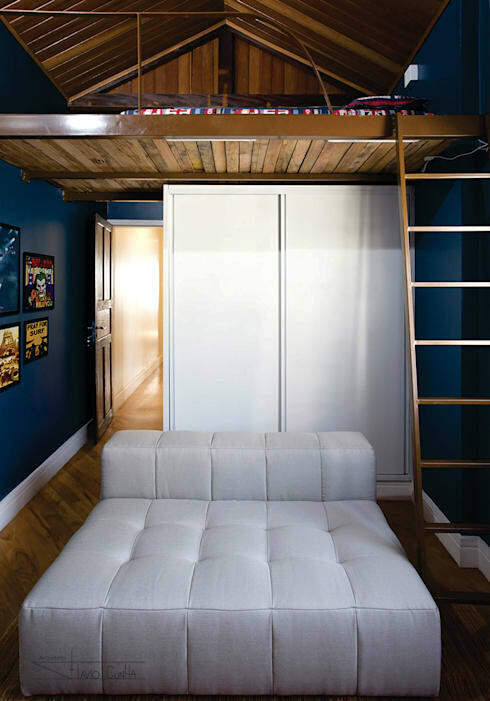 By incorporating a wooden mezzanine, enough space was achieved to create a lounge and a home office. 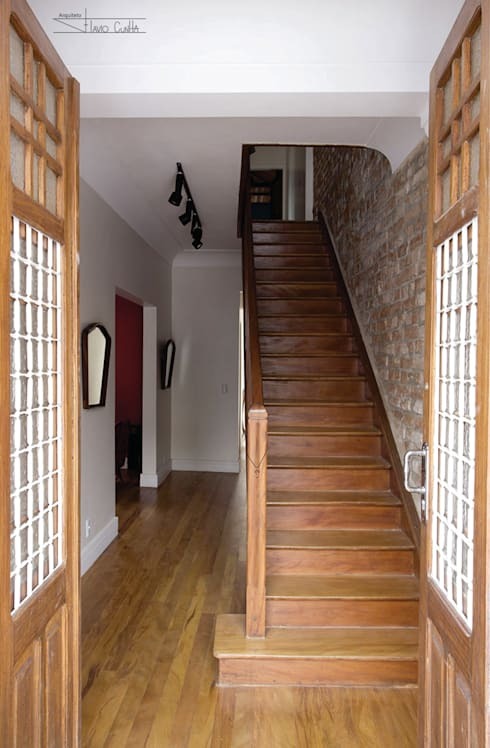 The vertical wood staircase stands out for its simplicity and functionality. 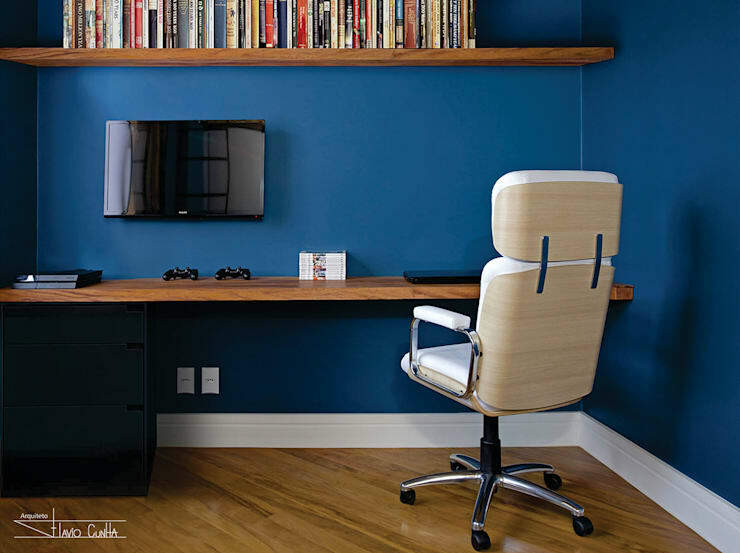 The optimization of space in the dormitory allowed the creation of a home office. The custom-made wooden shelves along with royal blue walls, add practicality and personality to the environment. 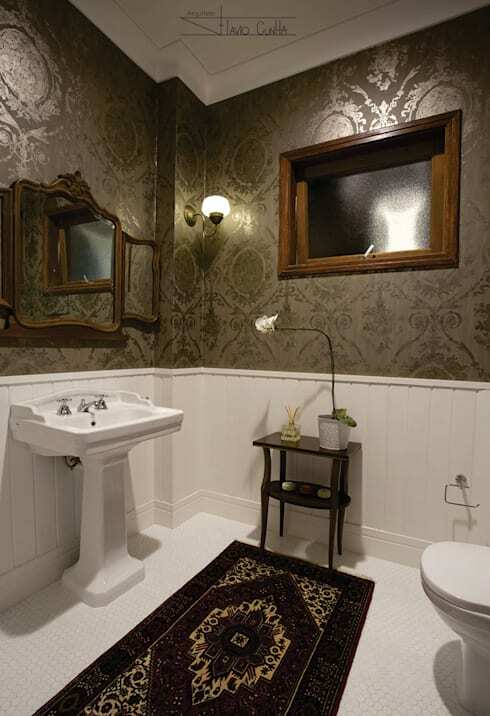 The guest bath follows a more classic line, with vintage design, wood framed mirror, and brown floral print wallpaper. It enhances the elegance and traditional style of the environment. 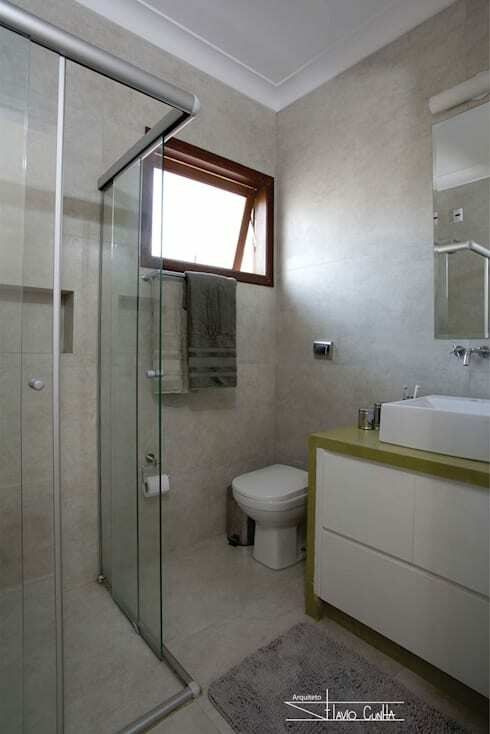 The bath of the couple stands out for its modern finish achieved by cement coated walls. Also, the place has gained a new cabinet which supports a contemporary design along with a glass shower cabin. With such elements, the minimalist style of the environment is highlighted correctly. In the yard, between the main building and the compound, a small garden provides a pleasant outdoor space for the residents. The spiral-shaped concrete staircase offers direct access to the upper deck from the outside. It adds a practical touch to the area. 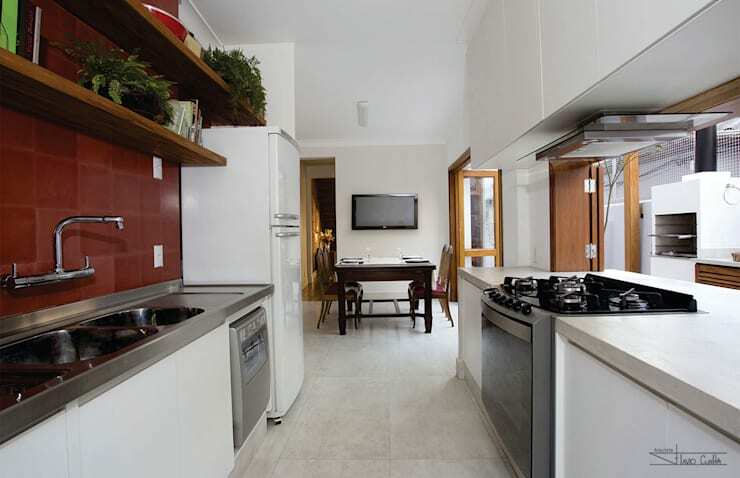 This space houses a kitchen and a leisure area. The use of a barbecue grill and a pizza oven makes it excellent for entertaining guests. It also highlights the wooden pergola that protects the environment. 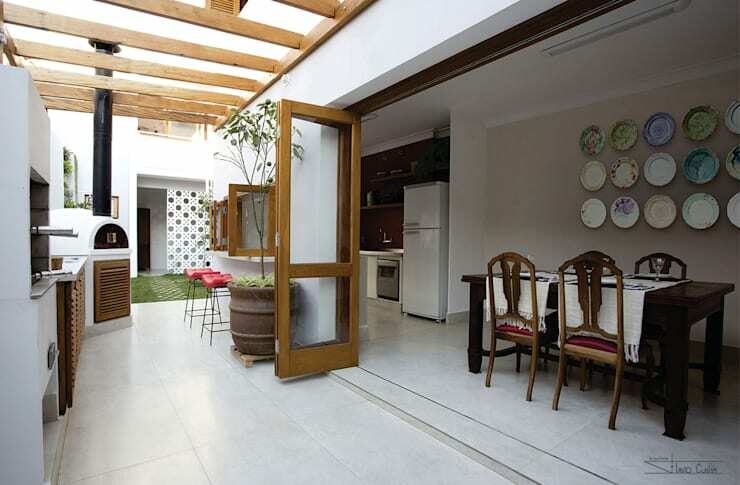 The kitchen and dining room open entirely into the external space through a large accordion-type door. It also enables a better use of light and natural ventilation. The kitchen exudes modernity and practicality. The design includes a white ceramic floor, white-lacquer wood cabinets, wooden shelves and red ceramic coating next to the sink.